US$ 8.00	Unit-price for online samples purchase only. 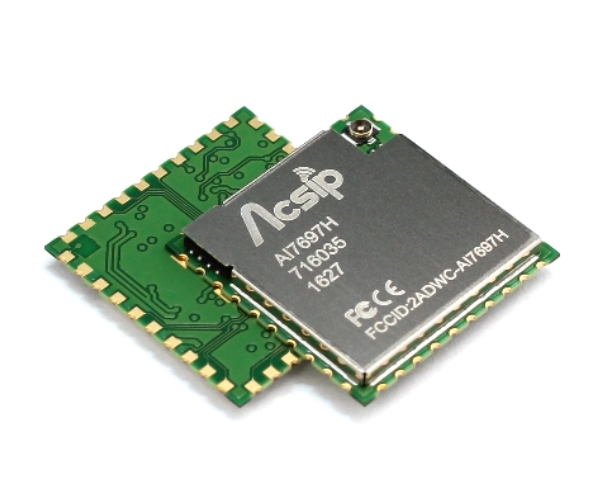 AI7697H is a highly integrated SIP module which features an application processor, a low power 1x1 11n single-band Wi-Fi subsystem, a Bluetooth subsystem, and a Power Management Unit. The application processor subsystem contains an ARM Cortex-M4F MCU, which has Many peripherals, including UART, I2C, SPI, I2S, PWM, IrDA, and auxiliary ADC. 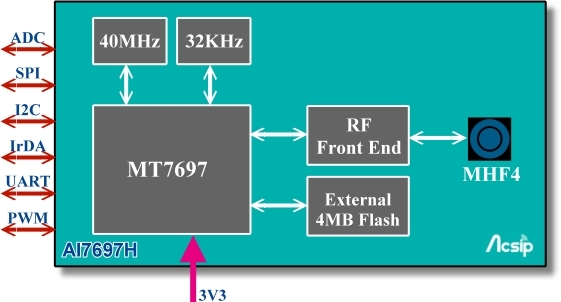 AI7697H also includes embedded SRAM/ROM and an external 4MB serial flash. For more information, or for sales inquiries, please contact AcSiP Technology Corp.